We had snow showers most of the day yesterday and now the temperatures have dropped and the wind has come up. 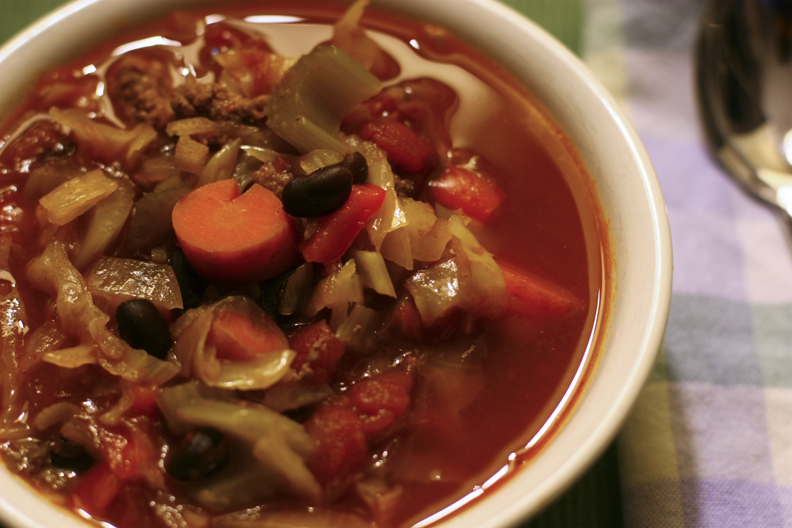 It’s the perfect weather for some hearty soup with lots of anti-oxidant rich vegetables. I love the gentle cooking of the crock pot, blending all the flavors and yet leaving the vegetables still with a little crunch. Partially brown the meat in a frying pan and drain off some of the fat, if desired. (see note) Place all ingredients in a slow-cooker and cook on high for 5 hours or low for 8 – 10 hours. Adjust seasonings and serve. Note: I retain most of the fat for my soup as we eat a low carb diet. The fat keeps us feeling satisfied without having to add bread or some other high carb side and adds fewer calories to each serving than a serving of bread would. The fat in grass or range fed beef has a healthier fat content (usually containing more healthy omega fatty acids) than standard supermarket beef. Diabetic note: This soup should be fairly sugar-stable for most diabetics, but with the inclusion of carrots and beans it would be wise the first time you make it for you to test your blood sugar an hour after eating to make sure it does not cause a spike. I’m curious as to where you get your beef?